Indicate by check mark whether the registrant is a large accelerated filer, an accelerated filer, a non-accelerated filer, a smaller reporting company, or an emerging growth company. See the definitions of “large accelerated filer,” “accelerated filer,” “smaller reporting company,” and “emerging growth company,” in Rule 12b-2 of the Exchange Act. The aggregate market value of the registrant’s common stock held by non-affiliates of the registrant as of the last business day of the registrant’s most recently completed second fiscal quarter (August 4, 2018) was approximately $11,956,587,132. Unless the context requires otherwise, references to “Macy’s” or the “Company” are references to Macy’s and its subsidiaries and references to “2018,” “2017,” “2016,” “2015” and “2014” are references to the Company’s fiscal years ended February 2, 2019, February 3, 2018, January 28, 2017, January 30, 2016 and January 31, 2015, respectively. Fiscal year 2017 included 53 weeks; fiscal years 2018, 2016, 2015 and 2014 included 52 weeks. duties, taxes, other charges and quotas on imports. In addition to any risks and uncertainties specifically identified in the text surrounding such forward-looking statements, the statements in the immediately preceding sentence and the statements under captions such as “Risk Factors” in reports, statements and information filed by the Company with the SEC from time to time constitute cautionary statements identifying important factors that could cause actual amounts, results, events and circumstances to differ materially from those expressed in or implied by such forward-looking statements. The Company is a corporation organized under the laws of the State of Delaware in 1985. The Company and its predecessors have been operating department stores since 1830. The Company operates 867 stores in 43 states, the District of Columbia, Puerto Rico and Guam. As of February 2, 2019, the Company's operations were conducted through Macy's, Bloomingdale's, Bloomingdale’s The Outlet, Macy’s Backstage, and bluemercury. In addition, Bloomingdale's in Dubai, United Arab Emirates and Al Zahra, Kuwait are operated under license agreements with Al Tayer Insignia, a company of Al Tayer Group, LLC. The Company sells a wide range of merchandise, including apparel and accessories (men’s, women’s and kids'), cosmetics, home furnishings and other consumer goods. The specific assortments vary by size of store, merchandising assortments and character of customers in the trade areas. Most stores are located at urban or suburban sites, principally in densely populated areas across the United States. (a) Other primarily includes restaurant sales, certain loyalty program income and breakage income from unredeemed gift cards. In 2018, the Company’s subsidiaries provided various support functions to the Company’s retail operations on an integrated, company-wide basis. The Company’s wholly-owned bank subsidiary, FDS Bank, provides certain collections, customer service and credit marketing services in respect of all credit card accounts that are owned either by Department Stores National Bank (“DSNB”), a subsidiary of Citibank, N.A., or FDS Bank and that constitute a part of the credit programs of the Company’s retail operations. Macy’s Systems and Technology, Inc. (“MST”), a wholly-owned indirect subsidiary of the Company, provides operational electronic data processing and management information services to all of the Company’s operations other than bluemercury. Macy’s Merchandising Group, Inc. (“MMG”), a wholly-owned direct subsidiary of the Company, and its subsidiary Macy's Merchandising Group International, LLC, are responsible for the design, development and marketing of Macy’s private label brands and certain licensed brands. Bloomingdale’s uses MMG for a small portion of its private label merchandise. The Company believes that its private label merchandise differentiates its merchandise assortments from those of its competitors and delivers exceptional value to its customers. MMG also offers its services, either directly or indirectly, to unrelated third parties. Macy’s Logistics and Operations (“Macy’s Logistics”), a division of a wholly-owned indirect subsidiary of the Company, provides warehousing and merchandise distribution services for the Company’s operations and digital customer fulfillment. The Company’s executive offices are located at 7 West Seventh Street, Cincinnati, Ohio 45202, telephone number: (513) 579-7000 and 151 West 34th Street, New York, New York 10001, telephone number: (212) 494-1602. As of February 2, 2019, excluding seasonal employees, the Company had approximately 130,000 employees, primarily including regular full-time and part-time. Because of the seasonal nature of the retail business, the number of employees peaks in the holiday season. Approximately 7% of the Company’s employees were represented by unions as of February 2, 2019. The retail business is seasonal in nature with a high proportion of sales and operating income generated in the months of November and December. Working capital requirements fluctuate during the year, increasing in mid-summer in anticipation of the fall merchandising season and increasing substantially prior to the holiday season when the Company carries significantly higher inventory levels. The Company purchases merchandise from many suppliers, no one of which accounted for more than 5% of the Company’s purchases during 2018. The Company has no material long-term purchase commitments with any of its suppliers, and believes that it is not dependent on any one supplier. The Company considers its relations with its suppliers to be good. The principal private label brands currently offered by the Company include Alfani, American Rag, Aqua, Bar III, Belgique, Charter Club, Club Room, Epic Threads, first impressions, Giani Bernini, Greg Norman for Tasso Elba, Holiday Lane, Home Design, Hotel Collection, Hudson Park, Ideology, I-N-C, jenni, JM Collection, John Ashford, Karen Scott, lune+aster, M-61, Maison Jules, Martha Stewart Collection, Material Girl, Morgan Taylor, Oake, Sky, Style & Co., Sutton Studio, Tasso Elba, Thalia Sodi, the cellar, and Tools of the Trade. The trademarks associated with the Company's aforementioned private label brands, other than American Rag, Greg Norman for Tasso Elba, Martha Stewart Collection, Material Girl and Thalia Sodi, are owned by the Company. The American Rag, Greg Norman, Martha Stewart Collection, Material Girl and Thalia Sodi brands are owned by third parties, which license the trademarks associated with such brands to Macy’s pursuant to agreements. The agreements for American Rag, Greg Norman, Material Girl, and Thalia Sodi expire at the end of 2019, while the Martha Stewart agreement has renewal rights that extend through 2025. The retail industry is highly competitive. The Company’s operations compete with many retail formats on the national and local level, including department stores, specialty stores, general merchandise stores, manufacturers' outlets, off-price and discount stores, online retailers, catalogs and television shopping, among others. The Company seeks to attract customers by offering desirable selections, obvious value, and distinctive marketing in stores that are located in premier locations, and by providing an exciting shopping environment and superior service through an omnichannel experience. Other retailers may compete for customers on some or all of these bases, or on other bases, and may be perceived by some potential customers as being better aligned with their particular preferences. Any of these items are also available in print to any shareholder who requests them. Requests should be sent to the Corporate Secretary of Macy’s, Inc. at 7 West Seventh Street, Cincinnati, OH 45202. Jeff Gennette has been Chief Executive Officer of the Company since March 2017 and Chairman of the Board since January 2018; prior thereto he was President from March 2014 to August 2017, Chief Merchandising Officer from February 2009 to March 2014, Chairman and Chief Executive Officer of Macy’s West in San Francisco from February 2008 to February 2009 and Chairman and Chief Executive Officer of Seattle-based Macy’s Northwest from February 2006 through February 2008. Paula A. Price has been Executive Vice President and Chief Financial Officer of the Company since July 2018; prior thereto she was a full-time lecturer in the Accounting and Management Unit at Harvard Business School from January 2014 to July 2018 and Executive Vice President and Chief Financial Officer of Ahold USA from May 2009 to January 2014. Harry (Hal) A. Lawton III has been President of the Company since September 2017; prior thereto he served as Senior Vice President, North America at eBay, Inc. from April 2015 to September 2017 and held a number of leadership positions at Home Depot, Inc. from 2005 to 2015, including Senior Vice President of Merchandising and head of Home Depot’s online business. Elisa D. Garcia has been Executive Vice President, Chief Legal Officer and Secretary of the Company since September 2016; prior thereto she served as Chief Legal Officer of Office Depot, Inc. from December 2013 to September 2016, Executive Vice President and Secretary from July 2007 to September 2016 and General Counsel from July 2007 to December 2013. Danielle L. Kirgan has been Executive Vice President and Chief Human Resources Officer of the Company since October 2017; prior thereto she served as Senior Vice President, People at American Airlines Group, Inc. from October 2016 to October 2017, Chief Human Resources Officer at Darden Restaurants, Inc. from January 2015 to October 2016 and Senior Vice President from May 2010, Vice President, Global Human Resources at ACI Worldwide, Inc. from January 2009 to December 2009, and Vice President, Human Resources at Conagra Foods, Inc. from 2004 to 2008. Felicia Williams has been Senior Vice President, Controller and Enterprise Risk Officer of the Company since June 2016; prior thereto she served as Senior Vice President, Finance and Risk Management from February 2011 to June 2016, Senior Vice President, Treasury and Risk Management from September 2009 to February 2011, Vice President, Finance and Risk Management from October 2008 to September 2009, and Vice President, Internal Audit from March 2004 to October 2008. In evaluating Macy's, the risks described below and the matters described in “Forward-Looking Statements” should be considered carefully. Such risks and matters are numerous and diverse, may be experienced continuously or intermittently, and may vary in intensity and effect. Any of such risks and matters, individually or in combination, could have a material adverse effect on our business, prospects, financial condition, results of operations and cash flows, as well as on the attractiveness and value of an investment in Macy's securities. Our strategic initiatives may not be successful, which could negatively affect our profitability and growth. We are pursuing strategic initiatives to achieve our objective of accelerating profitable growth in our stores and our digital operations. This includes the adoption of new technologies, merchandising strategies and customer service initiatives all designed to improve the shopping experience. Our ability to achieve profitable growth is subject to the successful implementation of our strategic plans. If these investments or initiatives do not perform as expected or create implementation or operational difficulties, we may incur impairment charges and our profitability and growth could suffer. Our sales and operating results depend on consumer preferences and consumer spending. The fashion and retail industries are subject to sudden shifts in consumer trends and consumer spending. Our sales and operating results depend in part on our ability to predict or respond to changes in fashion trends and consumer preferences in a timely manner. We develop new retail concepts and continuously adjust our industry position in certain major and private-label brands and product categories in an effort to attract and retain customers. Any sustained failure to anticipate, identify and respond to emerging trends in lifestyle and consumer preferences could negatively affect our business and results of operations. Our sales are significantly affected by discretionary spending by consumers. Consumer spending may be affected by many factors outside of our control, including general economic conditions, consumer disposable income levels, consumer confidence levels, the availability, cost and level of consumer debt, consumer behaviors towards incurring and paying debt, the cost of basic necessities and other goods, the strength of the U.S. Dollar relative to foreign currencies and the effects of the weather or natural disasters. These factors can have psychological or economic impacts on consumers that affect their discretionary spending habits. Any decline in discretionary spending by consumers could negatively affect our business and results of operations. We face significant competition in the retail industry. We conduct our retail merchandising business under highly competitive conditions. Although Macy's is one of the nation’s largest retailers, we have numerous and varied competitors at the national and local levels, including department stores, specialty stores, general merchandise stores, manufacturers’ outlets, off-price and discount stores, online retailers, catalogs and television shopping, among others. Competition is characterized by many factors, including assortment, advertising, price, quality, service, location, reputation and credit availability. Any failure by us to compete effectively could negatively affect our business and results of operations. We face challenges as consumers migrate to online shopping and we depend on our ability to differentiate Macy's in retail's ever-changing environment. As consumers continue to migrate online, we face pressures to not only compete from a price perspective with our competitors, some of whom sell the same products, but also to differentiate Macy's to stay relevant in retail's ever-changing environment. We continue to significantly invest in our omnichannel capabilities to provide a seamless shopping experience to our customers between our brick and mortar locations and our online and mobile environments. Insufficient, untimely or misguided investments in this area could significantly impact our profitability and growth and affect our ability to attract new customers, as well as maintain our existing ones. In addition, declining customer store traffic and migration of sales from brick and mortar stores to digital platforms could lead to store closures, restructuring and other costs that could adversely impact our results of operations and cash flows. Our ability to grow depends in part on our brick and mortar stores remaining relevant to customers. We are investing in facilities and fixtures upgrades, merchandise assortment and customer service in selected stores to improve customer retention rates and overall customer satisfaction. Some stores are receiving targeted local marketing plans to drive customer traffic. While these “Growth” stores have outperformed the remainder of our store fleet, there can be no assurance that we will be able to achieve continued improvement in our brick and mortar business. Because we rely on the ability of our physical retail locations to remain relevant to customers, providing desirable and sought-out shopping experiences is critical to our financial success. Changes in consumer shopping habits, financial difficulties at other anchor tenants, significant mall vacancy issues, mall violence and new mall developments could each adversely impact the traffic at current retail locations and lead to a decline in our financial condition or performance. We may not be able to successfully execute our real estate strategy. We continue to explore opportunities to monetize our real estate portfolio, including sales of stores as well as non-store real estate such as warehouses, outparcels and parking garages. We also continue to evaluate our real estate portfolio to identify opportunities where the redevelopment value of our real estate exceeds the value of non-strategic operating locations. This strategy is multi-pronged and may include transactions, strategic alliances or other arrangements with mall developers or other unrelated third-parties. Due to the cyclical nature of real estate markets, the performance of our real estate strategy is inherently volatile and could have a significant impact on our results of operations or financial condition. Our revenues and cash requirements are affected by the seasonal nature of our business. Our business is seasonal, with a high proportion of revenues and operating cash flows generated during the second half of the year, which includes the fall and holiday selling seasons. A disproportionate amount of our revenues is in the fourth quarter, which coincides with the holiday season. Should holiday sales fall below our expectations, a disproportionately negative impact on our results of operations could occur. We incur significant additional expenses in the period leading up to the months of November and December in anticipation of higher sales volume in those periods, including costs for additional inventory, advertising and employees. If we are not successful in selling inventory, we may have to sell the inventory at significantly reduced prices or may not be able to sell the inventory at all, which could have a material adverse effect on our results of operations and cash flows. We depend on our ability to attract, train, develop and retain quality employees. Our business is dependent upon attracting, training, developing and retaining quality employees. Macy's has a large number of employees, many of whom are in entry level or part-time positions with historically high rates of turnover. The ability to meet our labor needs while controlling costs associated with hiring and training new employees is subject to external factors such as unemployment levels, prevailing wage rates, minimum wage legislation and changing demographics. In addition, as a large and complex enterprise operating in a highly competitive and challenging business environment, Macy's is highly dependent upon management personnel to develop and effectively execute successful business strategies and tactics. Any circumstances that adversely impact our ability to attract, train, develop and retain quality employees throughout the organization could negatively affect our business and results of operations. We depend on the success of advertising and marketing programs. Our business depends on effective marketing to create high customer traffic at stores and online. Macy's has many initiatives in this area, and we often change advertising and marketing programs to attract customers and increase sales. There can be no assurance as to our continued ability to effectively execute our advertising and marketing programs, and any failure to do so could negatively affect our business and results of operations. If cash flows from our private label credit card decrease, our financial and operational results may be negatively impacted. We previously sold most of our credit accounts and related receivables to Citibank. Following the sale, we share in the economic performance of the credit card program with Citibank. Deterioration in economic or political conditions could adversely affect the volume of new credit accounts, the amount of credit card program balances and the ability of credit card holders to pay their balances. These conditions could result in Macy’s receiving lower payments under the credit card program. Credit card operations are subject to many federal and state laws that may impose certain requirements and limitations on credit card providers. Citibank and our subsidiary bank, FDS Bank, may be required to comply with regulations that may negatively impact the operation of our private label credit card. This negative impact may affect our revenue streams derived from the sale of such credit card accounts and our financial results. Gross margins could suffer if we are unable to effectively manage our inventory. Our profitability depends on our ability to manage inventory levels and respond to shifts in consumer demand patterns. Overestimating customer demand for merchandise will likely result in the need to record inventory markdowns and sell excess inventory at clearance prices which would negatively impact our gross margins and operating results. Underestimating customer demand for merchandise can lead to inventory shortages, missed sales opportunities and negative customer experiences. Our defined benefit plan funding requirements or plan settlement expense could impact our financial results and cash flow. Significant changes in interest rates, decreases in the fair value of plan assets and timing and amount of benefit payments could affect the funded status of our plans and could increase future funding requirements of the plans. A significant increase in future funding requirements could have a negative impact on our cash flows, financial condition or results of operations. These plans allow eligible retiring employees to receive lump sum distributions of benefits earned. Under applicable accounting rules, if annual lump sum distributions exceed an actuarially determined threshold of the total of the annual service and interest costs, we would be required to recognize in the current period of operations a settlement expense of a portion of the unrecognized actuarial loss and could have a negative impact on our results of operations. Increases in the cost of employee benefits could impact our financial results and cash flow. Our expenses relating to employee health benefits are significant. Unfavorable changes in the cost of such benefits could negatively affect our financial results and cash flow. Healthcare costs have risen significantly in recent years, and recent legislative and private sector initiatives regarding healthcare reform have resulted and could continue to result in significant changes to the U.S. healthcare system. Due to uncertainty regarding legislative or regulatory changes, we are not able to fully determine the impact that future healthcare reform will have on our company-sponsored medical plans. If our company’s reputation and brand are not maintained at a high level, our operations and financial results may suffer. We believe our reputation and brand are partially based on the perception that we act equitably and honestly in dealing with our customers, employees, business partners and shareholders. Our reputation and brand may be deteriorated by any incident that erodes the trust or confidence of our customers or the general public, particularly if the incident results in significant adverse publicity or governmental inquiry. In addition, information concerning us, whether or not true, may be instantly and easily posted on social media platforms at any time, which information may be adverse to our reputation or brand. The harm may be immediate without affording us an opportunity for redress or correction. If our reputation or brand is damaged, our customers may refuse to continue shopping with us, potential employees may be unwilling to work for us, business partners may be discouraged from seeking future business dealings with us and, as a result, our operations and financial results may suffer. If we are unable to protect our intellectual property, our brands and business could be damaged. We believe that our copyrights, trademarks, trade dress, trade secrets and similar intellectual property are important assets and key elements of our strategy, including those related to our private brand merchandise. We rely on copyright and trademark law, trade secret protection and confidentiality agreements with our employees, consultants, vendors and others to protect our proprietary rights. If the steps we take to protect our proprietary rights are inadequate, or if we are unable to protect or preserve the value of our copyrights, trademarks, trade secrets and other proprietary rights for any reason, our merchandise brands and business could be negatively affected. Our sales and operating results could be adversely affected by product safety concerns. If Macy's merchandise offerings do not meet applicable safety standards or consumers' expectations regarding safety, we could experience decreased sales, increased costs and/or be exposed to legal and reputational risk. Events that give rise to actual, potential or perceived product safety concerns could expose Macy's to government enforcement action and/or private litigation. Reputational damage caused by real or perceived product safety concerns could negatively affect our business and results of operations. A shutdown or disruption in our distribution and fulfillment centers could have an adverse impact on our business and operations. Our business depends on the orderly receipt and distribution of merchandise and effective management of our distribution and fulfillment centers. Unforeseen disruptions in operations due to fire, severe weather conditions, natural disasters or other catastrophic events, labor disagreements, or other shipping problems may result in the loss or unavailability of inventory and/or delays in the delivery of merchandise to our stores and customers. A material disruption in our computer systems could adversely affect our business or results of operations. We rely extensively on our computer systems to process transactions, summarize results and manage our business. Our computer systems are subject to damage or interruption from power outages, computer and telecommunications failures, computer viruses, cyber-attack or other security breaches, catastrophic events such as fires, floods, earthquakes, tornadoes, hurricanes, acts of war or terrorism, and usage errors by our employees. If our computer systems are damaged or cease to function properly, including a material disruption in our ability to authorize and process transactions at our stores or on our online systems, we may have to make a significant investment to fix or replace them, and we may suffer loss of critical data and interruptions or delays in our operations. Any material interruption in our computer systems could negatively affect our business and results of operations. If our technology-based e-commerce systems do not function properly, our operating results could be negatively affected. Customers are increasingly using computers, tablets and smart phones to shop online and to do price and comparison shopping. We strive to anticipate and meet our customers’ changing expectations and are focused on building a seamless shopping experience across our omnichannel business. Any failure to provide user-friendly, secure e-commerce platforms that offer a variety of merchandise at competitive prices with low cost and quick delivery options that meet customers’ expectations could place us at a competitive disadvantage, result in the loss of e-commerce and other sales, harm our reputation with customers and have a material adverse impact on the growth of our business and our operating results. A breach of information technology systems could adversely affect our reputation, business partner and customer relationships and operations, and result in high costs. Through our sales, marketing activities, and use of third-party information, we collect and store certain non-public personal information that customers provide to purchase products or services, enroll in promotional programs, register on websites, or otherwise communicate to us. This may include phone numbers, driver license numbers, contact preferences, personal information stored on electronic devices, and payment information, including credit and debit card data. We gather and retain information about employees in the normal course of business. We may share information about such persons with vendors that assist with certain aspects of our business. In addition, our online operations depend upon the transmission of confidential information over the Internet, such as information permitting cashless payments. We employ safeguards for the protection of this information and have made significant investments to secure access to our information technology network. For instance, we have implemented authentication protocols, installed firewalls and anti-virus/anti-malware software, conducted continuous risk assessments, and established data security breach preparedness and response plans. We also employ encryption and other methods to protect our data, promote security awareness with our associates and work with business partners in an effort to create secure and compliant systems. However, these protections may be compromised as a result of third-party security breaches, burglaries, cyberattacks, errors by employees or employees of third-party vendors, or contractors, misappropriation of data by employees, vendors or unaffiliated third-parties, or other irregularities that may result in persons obtaining unauthorized access to company data. Retail data frequently targeted by cybercriminals includes consumer credit card data, personally identifiable information, including social security numbers, and health care information. For retailers, point of sale and e-commerce websites are often attacked through compromised credentials, including those obtained through phishing, vishing and credential stuffing. Other methods of attack include advanced malware, the exploitation of software and operating vulnerabilities, and physical device tampering/skimming at card reader units. We believe these attack methods will continue to evolve. cause us to incur substantial costs, including costs associated with remediation of information technology systems, customer protection costs and incentive payments for the maintenance of business relationships, litigation costs, lost revenues resulting from negative changes in consumer shopping patterns, unauthorized use of proprietary information or the failure to retain or attract customers following an attack. While we maintain insurance coverage that may, subject to policy terms and conditions, cover certain aspects of cyber risks, such insurance coverage may be unavailable or insufficient to cover all losses or all types of claims that may arise in the continually evolving area of cyber risk. We depend upon designers, vendors and other sources of merchandise, goods and services. Our business could be affected by disruptions in, or other legal, regulatory, political or economic issues associated with, our supply network. Our relationships with established and emerging designers have been significant contributors to Macy's past success. Our ability to find qualified vendors and access products in a timely and efficient manner is often challenging, particularly with respect to goods sourced outside the United States. We source the majority of our merchandise from manufacturers located outside the U.S., primarily Asia. Any major changes in tax policy, such as the disallowance of tax deductions for imported merchandise could have a material adverse effect on our business, results of operations and liquidity. The procurement of all our goods and services are subject to the effects of price increases which we may or may not be able to pass through to our customers. In addition, our procurement of goods and services from outside the U.S. is subject to risks associated with political or financial instability, trade restrictions, tariffs, currency exchange rates, transport capacity and costs and other factors relating to foreign trade. All of these factors may affect our ability to access suitable merchandise on acceptable terms, are beyond our control and could negatively affect our business and results of operations. On September 18, 2018, the Office of the U.S. Trade Representative announced that the current U.S. Administration would impose a 10% tariff on approximately $200 billion worth of imports from China into the U.S. effective September 24, 2018, which was expected to increase to 25% starting January 1, 2019. On December 19, 2018, the U.S. Trade representative announced a modification to the effective date of the 25% tariffs on China goods from January 1, 2019 to March 2, 2019. We are evaluating the potential impact of the effective and proposed tariffs as well as other recent changes in foreign trade policy on our supply chain, costs, sales and profitability and are considering strategies to mitigate such impact, including reviewing sourcing options and working with our vendors and merchants. While it is too early to predict how these changes in foreign trade policy and any recently enacted, proposed and future tariffs on products imported by us from China will affect our business, these changes could negatively impact our business and results of operations if they seriously disrupt the movement of products through our supply chain or increase their cost. In addition, while we may be able to shift our sourcing options, executing such a shift would be time consuming and would be difficult or impracticable for many products and may result in an increase in our manufacturing costs. The adoption and expansion of trade restrictions, retaliatory tariffs, or other governmental action related to tariffs or international trade agreements or policies has the potential to adversely impact demand for our products, our costs, our customers, our suppliers, and/or the U.S. economy, which in turn could adversely impact our results of operations and business. Disruption of global sourcing activities and quality concerns over our own brands could negatively impact brand reputation and earnings. Economic and civil unrest in areas of the world where we source products, as well as shipping and dockage issues, could adversely impact the availability or cost of our products, or both. Most of Macy’s goods imported to the U.S. arrive from Asia through ports located on the U.S. west coast and are subject to potential disruption due to labor unrest, security issues or natural disasters affecting any or all of these ports. In addition, in recent years, we have substantially increased the number and types of merchandise that are sold under Macy’s proprietary brands. While we have focused on the quality of our proprietary branded products, we rely on third-parties to manufacture these products. Such third-party manufacturers may prove to be unreliable, the quality of our globally sourced products may vary from expectations and standards, the products may not meet applicable regulatory requirements which may require us to recall these products, or the products may infringe upon the intellectual property rights of third-parties. We face challenges in seeking indemnities from manufacturers of these products, including the uncertainty of recovering on such indemnity and the lack of understanding by manufacturers of U.S. product liability laws in certain foreign jurisdictions. Parties with whom Macy's does business may be subject to insolvency risks or may otherwise become unable or unwilling to perform on their obligations to us. Macy's is a party to contracts, transactions and business relationships with various third parties, including, without limitation, vendors, suppliers, service providers, lenders and participants in joint ventures, strategic alliances and other joint commercial relationships, pursuant to which such third parties have performance, payment and other obligations to Macy's. In some cases, we depend upon such third parties to provide essential leaseholds, products, services or other benefits, including with respect to store and distribution center locations, merchandise, advertising, software development and support, logistics, other agreements for goods and services to operate our business in the ordinary course, extensions of credit, credit card accounts and related receivables, and other vital matters. Current economic, industry and market conditions could result in increased risks to Macy's associated with the potential financial distress or insolvency of such third parties. If any of these third parties were to become subject to bankruptcy, receivership or similar proceedings, the rights and benefits with respect to our contracts, transactions and business relationships with such third parties could be terminated, modified in a manner adverse to us, or otherwise impaired. We may be unable to arrange for alternate or replacement contracts, transactions or business relationships on terms as favorable as existing contracts, transactions or business relationships. Our inability to do so could negatively affect our cash flows, financial condition and results of operations. Macy’s business is subject to unfavorable economic and political conditions and other related risks. Unfavorable global, domestic or regional economic or political conditions and other developments and risks could negatively affect our business and results of operations. For example, unfavorable changes related to interest rates, rates of economic growth, fiscal and monetary policies of governments, inflation, deflation, consumer credit availability, consumer debt levels, consumer debt payment behaviors, tax rates and policy, unemployment trends, energy prices, and other matters that influence the availability and cost of merchandise, consumer confidence, spending and tourism could negatively affect our business and results of operations. In addition, unstable political conditions, civil unrest, terrorist activities and armed conflicts may disrupt commerce and could negatively affect our business and results of operations. Our effective tax rate is impacted by a number of factors, including changes in federal or state tax law, interpretation of existing laws and the ability to defend and support the tax positions taken on historical tax returns. Certain changes in any of these factors could materially impact the effective tax rate and net income. Our business could be affected by extreme weather conditions, regional or global health pandemics or natural disasters. Extreme weather conditions in the areas in which our stores are located could negatively affect our business and results of operations. For example, frequent or unusually heavy snowfall, ice storms, rainstorms or other extreme weather conditions over a prolonged period could make it difficult for our customers to travel to our stores and thereby reduce our sales and profitability. Our business is also susceptible to unseasonable weather conditions. For example, extended periods of unseasonably warm temperatures during the winter season or cool weather during the summer season could reduce demand for a portion of our inventory and thereby reduce our sales and profitability. In addition, extreme weather conditions could result in disruption or delay of production and delivery of materials and products in our supply chain and cause staffing shortages in our stores. Our business and results of operations could also be negatively affected if a regional or global health pandemic were to occur, depending upon its location, duration and severity. Customers might avoid public places, such as our stores, or in extreme cases governments might limit or ban public gatherings or travel. A regional or global health pandemic might also result in disruption or delay of production and delivery of materials and products in our supply chain and cause staffing shortages in our stores. Natural disasters such as hurricanes, tornadoes and earthquakes, or a combination of these or other factors, could damage or destroy our facilities or make it difficult for customers to travel to our stores, thereby negatively affecting our business and results of operations. Litigation, legislation or regulatory developments could adversely affect our business and results of operations. operations. We are also subject to anti-bribery, customs, child labor, truth-in-advertising and other laws, including consumer protection regulations and zoning and occupancy ordinances that regulate retailers generally and/or govern the importation, promotion and sale of merchandise and the operation of retail stores and warehouse facilities. Although we undertake to monitor changes in these laws, if these laws change without our knowledge, or are violated by importers, designers, manufacturers, distributors or agents, we could experience delays in shipments and receipt of goods or be subject to fines or other penalties under the controlling regulations, any of which could negatively affect our business and results of operations. In addition, we are regularly involved in various litigation matters that arise in the ordinary course of our business. Adverse outcomes in current or future litigation could negatively affect our financial condition, results of operations and cash flows. Inability to access capital markets could adversely affect our business or financial condition. Changes in the credit and capital markets, including market disruptions, limited liquidity and interest rate fluctuations, may increase the cost of financing or restrict our access to this potential source of future liquidity. A decrease in the ratings that rating agencies assign to Macy’s short and long-term debt may negatively impact our access to the debt capital markets and increase our cost of borrowing. In addition, our bank credit agreements require us to maintain specified interest coverage and leverage ratios. Our ability to comply with the ratios may be affected by events beyond our control, including prevailing economic, financial and industry conditions. If our results of operations or operating ratios deteriorate to a point where we are not in compliance with our debt covenants, and we are unable to obtain a waiver, much of our debt would be in default and could become due and payable immediately. Our assets may not be sufficient to repay in full this indebtedness, resulting in a need for an alternate source of funding. We cannot make any assurances that we would be able to obtain such an alternate source of funding on satisfactory terms, if at all, and our inability to do so could cause the holders of our securities to experience a partial or total loss of their investments in Macy's. Factors beyond our control could affect Macy's stock price. investor perceptions of the investment opportunity associated with Macy’s common stock relative to other investment alternatives. We may fail to meet the expectations of our stockholders or of analysts at some time in the future. 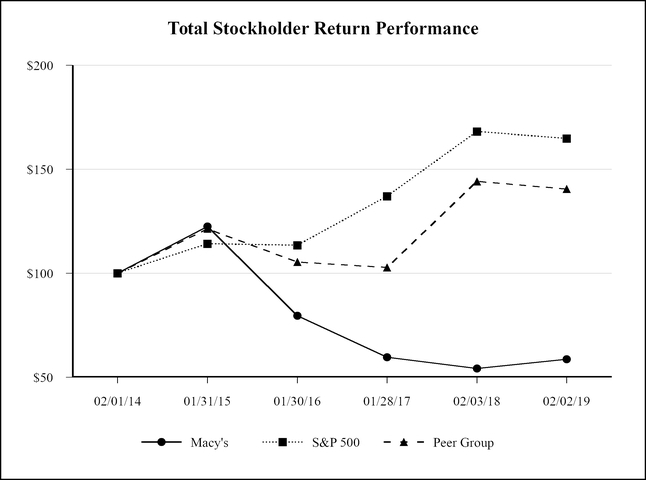 If the analysts who regularly follow Macy’s stock lower their rating or lower their projections for future growth and financial performance, Macy’s stock price could decline. Also, sales of a substantial number of shares of Macy’s common stock in the public market or the appearance that these shares are available for sale could adversely affect the market price of Macy’s common stock. The properties of the Company consist primarily of stores and related facilities, including a logistics network. The Company also owns or leases other properties, including corporate office space in Cincinnati and New York and other facilities at which centralized operational support functions are conducted. As of February 2, 2019, the operations of the Company included 867 stores in 43 states, the District of Columbia, Puerto Rico and Guam, comprising a total of approximately 126 million square feet. Of such stores, 360 were owned, 386 were leased, 117 stores were operated under arrangements where the Company owned the building and leased the land and four stores were comprised of partly owned and partly leased buildings. All owned properties are held free and clear of mortgages. Pursuant to various shopping center agreements, the Company is obligated to operate certain stores for periods of up to 15 years. Some of these agreements require that the stores be operated under a particular name. Most leases require the Company to pay real estate taxes, maintenance and other costs; some also require additional payments based on percentages of sales and some contain purchase options. Certain of the Company’s real estate leases have terms that extend for a significant number of years and provide for rental rates that increase or decrease over time. The five geographic regions detailed in the foregoing table are based on the Company’s Macy’s-branded operational structure. The Company’s retail stores are located at urban or suburban sites, principally in densely populated areas across the United States. The Company and its subsidiaries are involved in various proceedings that are incidental to the normal course of their businesses. As of the date of this report, the Company does not expect that any of such proceedings will have a material adverse effect on the Company’s financial position or results of operations. The Company's common stock is listed on the NYSE under the trading symbol “M.” As of February 2, 2019, the Company had approximately 14,625 stockholders of record. The declaration and payment of future dividends will be at the discretion of the Company’s Board of Directors, are subject to restrictions under the Company’s credit facility and may be affected by various other factors, including the Company’s earnings, financial condition and legal or contractual restrictions. The following table provides information regarding the Company’s purchases of common stock during the fourth quarter of 2018. Commencing in January 2000, the Company’s Board of Directors has from time to time approved authorizations to purchase, in the aggregate, up to $18 billion of Common Stock. All authorizations are cumulative and do not have an expiration date. As of February 2, 2019, $1,716 million of authorization remained unused. The Company may continue, discontinue or resume purchases of Common Stock under these or possible future authorizations in the open market, in privately negotiated transactions or otherwise at any time and from time to time without prior notice. The following graph compares the cumulative total stockholder return on the Company's common stock with the Standard & Poor's 500 Composite Index and the Company's peer group for the period from February 1, 2014 through February 2, 2019, assuming an initial investment of $100 and the reinvestment of all dividends, if any. The companies included in the peer group are Bed, Bath & Beyond, Dillard's, Gap, J.C. Penney, Kohl's, L Brands, Nordstrom, Ross Stores, Sears Holdings, Target, TJX Companies and Wal-Mart. The selected financial data set forth below should be read in conjunction with the Consolidated Financial Statements and the notes thereto and the other information contained elsewhere in this report. The Company adopted the Financial Accounting Standards Board ("FASB") Accounting Standards Update ("ASU") No. 2014-09, Revenue from Contracts with Customers, on February 4, 2018 using the full retrospective transition method and recast results from 2017 and 2016. Results from periods prior to 2016 have not been recast for the adoption of this standard. (a) Gross margin is defined as net sales less cost of sales. The Company is an omnichannel retail organization operating stores, websites and mobile applications under three brands (Macy's, Bloomingdale's and bluemercury) that sell a wide range of merchandise, including apparel and accessories (men's, women's and kids'), cosmetics, home furnishings and other consumer goods. The Company operates 867 stores in 43 states, the District of Columbia, Puerto Rico and Guam. As of February 2, 2019, the Company's operations were conducted through Macy's, Bloomingdale's, Bloomingdale’s The Outlet, Macy’s Backstage, and bluemercury, which are aggregated into one reporting segment in accordance with the FASB Accounting Standards Codification (“ASC”) Topic 280, Segment Reporting. Bloomingdale's in Dubai, United Arab Emirates and Al Zahra, Kuwait are operated under a license agreement with Al Tayer Insignia, a company of the Al Tayer Group, LLC. From Familiar to Favorite includes everything the Company does to further its brand awareness and identity to its core customers. Actions include understanding and anticipating customers’ needs, strengthening the Company's fashion authority and executing initiatives around its loyalty and pricing strategies. It celebrates the Company's iconic events and includes strategies to appeal to more value-oriented customers. It Must Be Macy’s encompasses delivering the products and experiences customers love and are exclusive to the Company. This includes styles and home fashion for every day and special occasions, from the Company's leading private brands, as well as exclusive national brands or assortments. Every Experience Matters, in-store and online. The Company's competitive advantage is the ability to combine the human touch in its physical stores with cutting-edge technology in its mobile applications and websites. Key to this point is the enhancement of a customer's experience as they explore the Company's stores, mobile applications and websites, find their favorite styles, sizes and colors, and receive their purchases through the shopping channels they prefer. Funding our Future represents the decisions and actions the Company takes to identify and realize resources to fuel growth. This involves a focus on cost reduction and reinvestment as well as creating value from the Company's real estate portfolio. What’s New, What’s Next explores and develops innovations to turn consumer and technology trends to the Company's advantage and to drive growth. This includes exploring previously unmet customer needs and making smart investment decisions based on customer insights and analytics. During 2018, the Company completed the foundational work for five key strategic initiatives underlying components of the North Star strategy. This activity resulted in positive contributions from each initiative during the fiscal year. The Macy's Star Rewards loyalty program marked its one-year anniversary and continued to offer improved benefits to its members, including exclusive experiences for the program's platinum loyalty members. Loyalty program members are shopping more and spending more in total, resulting in increased penetration of the Company's proprietary credit card. Additionally, a tender-neutral option was launched during 2018, resulting in the addition of more than three million new members to the loyalty program. to 172 (seven freestanding and 165 inside Macy's stores) as of February 2, 2019. The Company will expand to at least 45 more Backstage locations within Macy's stores in 2019. The Company enhanced customer options for pick-up, delivery and checkout at Macy's, including the expansion of Buy Online Pickup in Stores ("BOPS"), launch of Buy Online Ship to Store ("BOSS") and creation of At Your Service stations in all stores. The Company's vendor direct program (merchandise purchased from the Company's websites and digital applications and shipped directly to customers from the respective vendor) continued its expansion during 2018, with increased assortment and the addition of new categories and brands. This program will continue its expansion into more categories and brands in 2019. The Growth50 locations (a mix of stores where the Company accelerated a number of successful store initiatives, such as facility upgrades, merchandising strategies, and localized marketing) contributed to the strong operating results for 2018, with sales results outperforming the other Macy's locations. As a result of the performance of the Growth50 locations, the Company will expand the initiative to another 100 stores in 2019, creating the Growth150. 2018 was also a year of innovation. The Company acquired STORY and invested in b8ta to integrate in-store experiences with innovative technology and increase customer engagement. STORY is a concept store in New York City that reinvents itself every few weeks to attract new customers and retain existing ones. b8ta is a technology-powered retailer whose software platform provides an automated and seamless experience for emerging brands launching a physical retail presence. This technology platform allows the Company to implement its Market @ Macy's concept, also launched during 2018, across its store base at a faster pace. The Company also delivered the first national virtual reality roll-out in retail, opening over 100 virtual reality furniture galleries in 2018. The Company will carry three of its 2018 strategic initiatives forward into 2019 (Growth150, Backstage, and vendor direct) and will add two new initiatives: 1) the enhancement of the Company's mobile platforms and 2) investment in destination businesses comprising six merchandise categories (dresses, fine jewelry, big ticket, men's tailored, women's shoes and beauty). As part of the Company's commitment to increased productivity to fund investment in the business, in February 2019 the Company launched a comprehensive, multi-year program focused on growing its profitability rate by improving productivity across the enterprise. The program includes initiatives to improve margin through enhanced inventory planning and operations, supply chain efficiencies, pricing optimization, improved private brand sourcing and customer acquisition and retention strategies. As an initial step, the Company developed a plan in 2018 that reduces the complexity of the upper management structure to increase the speed of decision making, reduce costs and respond to changing customer expectations. Beginning in 2019, the Company expects the announced restructuring actions to generate annual expense savings of $100 million. In addition to the expected 2019 savings, the Company anticipates that these activities will fuel the productivity plan over the next three to five years and contribute significantly to profitable growth. For 2018, the Company recorded expense of approximately $80 million of severance and other human resource-related costs associated with these restructuring activities. In 2018, the Company continued to execute on its real estate strategy through both monetization and redevelopment of certain assets. Overall, the Company had asset sale gains of $389 million, totaling $474 million in cash proceeds in 2018. Included in these gains and proceeds are the sale of the former I. Magnin building in Union Square San Francisco, the sale of the upper seven floors of the Macy's State Street store in Chicago, as well as the continued recognition of the deferred gain from Macy's Brooklyn transaction executed in 2015. During 2018, the Company announced a retail store strategy for Macy's that focuses on identifying a scalable investment strategy for all of the brand's stores, improving the customer's experience and growing total sales profitably. This strategy includes categorization of the Company's Macy's stores into three groups: Flagship, Magnet and Neighborhood stores. Flagship stores include Herald Square and 10 other regional flagship stores which serve as premier retail destinations within their respective regions. Magnet stores are retail destinations within major markets that offer an expanded selection of merchandise. Included within these stores are the Growth50 stores, which, as noted previously, will be expanded to another 100 stores in 2019. Neighborhood stores are smaller locations that are visited primarily for convenience and on-line order fulfillment. Bloomingdale's had a strong 2018, including an improved trend in stores performance and online growth. Notably, the renovation of Bloomingdale’s flagship store at 59th Street brought new energy, products and experiences to this location, serving as a shopping destination for both locals and tourists. The Company continued its growth of its luxury beauty products and spa retailer, bluemercury, by opening additional freestanding bluemercury stores in urban and suburban markets and adding bluemercury products and boutiques to Macy's stores. As of February 2, 2019, the Company is operating 183 bluemercury locations (163 freestanding and 20 inside Macy's stores). In January 2019, the Company ended the joint venture with Fung Retailing Limited after winding down the operations of Macy's China Limited earlier in 2018. In conjunction with the termination of the joint venture, the Company acquired the noncontrolling interest in Macy's China Limited from Fung Retailing Limited, resulting in one hundred percent ownership. For the period of time prior to the acquisition of the noncontrolling interest, Fung Retailing Limited's thirty-five percent proportionate share of the results of Macy's China Limited was reported as noncontrolling interest in the Consolidated Financial Statements. Net sales increased 0.1% compared to 2017, which included a 53rd week of operations. Comparable sales on an owned basis increased 1.7% and comparable sales on an owned plus licensed basis increased 2.0%. Asset sale gains decreased $155 million to $389 million compared to 2017. Federal, state, and local income tax expense for 2018 was $322 million compared to a benefit of $39 million in 2017, which included a non-cash tax benefit of $584 million associated with the remeasurement of the Company's deferred tax balances due to U.S. federal tax reform enacted in 2017. As a result of U.S. federal tax reform, the Company's federal statutory effective tax rate declined to 21% in January 2018 from 35%. Net income attributable to Macy's, Inc. shareholders for 2018 was $1,108 million, a decrease of $458 million from $1,566 million in 2017. Diluted earnings per share attributable to Macy's, Inc. shareholders decreased to $3.56 in 2018 compared to $5.10 in 2017. Excluding restructuring, impairment, store closing and other costs, settlement charges, losses and gains on early retirement of debt and the deferred tax effects of U.S. federal tax reform, adjusted diluted earnings per share attributable to Macy's, Inc. shareholders increased to $4.18 in 2018 from $3.79 in 2017. In addition, excluding asset sales gains, adjusted diluted earnings per share attributable to Macy's, Inc. shareholders increased to $3.26 in 2018 from $2.69 in 2017. Earnings before interest, taxes, depreciation and amortization excluding restructuring, impairment, store closing and other costs and settlement charges ("Adjusted EBITDA") was $2,877 million in 2018, as compared to $3,109 million in 2017. Return on invested capital ("ROIC"), a key measure of operating productivity, was 19.9% for 2018 compared to 20.8% for 2017. The Company repurchased $1,094 million of debt in 2018, consisting of $344 million of debt repurchased in the open market and $750 million of debt repurchased in a tender offer ("tender offer"). See pages 29 to 32 for reconciliations of the non-GAAP financial measures presented above to the most comparable U.S. generally accepted accounting principles ("GAAP") financial measures and other important information. See pages 29 to 32 for a reconciliation of these non-GAAP financial measures to their most comparable GAAP financial measure and for other important information. Net sales for 2018 were $24,971 million, an increase of $32 million, or 0.1%, from 2017, which included a 53rd week of operations. The increase in comparable sales on an owned basis, which excludes the 53rd week of sales in 2017, for 2018 was 1.7% compared to 2017. The increase in comparable sales on an owned plus licensed basis for 2018 was 2.0% compared to 2017. Geographically, sales in 2018 were strongest in the South, Southwest and Northeast regions of the country. Digital sales continued to be strong in 2018 and experienced double digit growth. By family of business, sales in 2018 were strongest in active apparel, fine jewelry, fragrances, men's tailored clothing, kids', women's shoes, dresses and furniture. Sales in 2018 were less strong in women's sportswear collections, handbags, fashion watches and color cosmetics. Sales of the Company's private label brands represented approximately 20% of net sales in the Macy's-branded operations in both 2018 and 2017. Net credit card revenues were $768 million for 2018, an increase of $66 million compared to $702 million recognized in 2017. Increased proprietary card usage driven by the enhanced Macy's Star Rewards loyalty program and higher consumer credit balances drove the favorable results. Proprietary card penetration increased to 46.9% in 2018 from 46.2% in 2017. Cost of sales for 2018 increased $34 million from 2017. The cost of sales rate as a percent to net sales of 60.9% in 2018 was flat to 2017, primarily due to lower merchandise costs, including lower markdowns, which offset higher delivery expenses associated with the Company's omnichannel activities, free shipping promotions and loyalty programs. SG&A expenses for 2018 increased $85 million from 2017 and the SG&A rate as a percent to net sales increased 30 basis points to 36.2% as compared to 2017. The dollar and rate increase compared to 2017 was primarily reflective of investments in the Company's strategic initiatives, technology and the Company's new employee incentive plan. In addition, advertising expense, net of cooperative advertising allowances, increased to $1,162 million in 2018 from $1,108 million in 2017. The Company recognized gains of $389 million in 2018 associated with sales of real estate, as compared to $544 million in 2017. 2018 included gains of $178 million related to the I. Magnin building in Union Square San Francisco and $58 million related to the continued recognition of the deferred gain from the Macy's Brooklyn transaction which closed in 2015. 2017 included gains of $234 million related to the Macy's Union Square location, $71 million related to the Macy's Brooklyn transaction, $47 million related to the downtown Minneapolis properties and $40 million related to the downtown Seattle Macy's location. Restructuring, impairment, store closing and other costs for 2018 and 2017 of $136 million and $186 million, respectively, included severance and other human resource-related costs, asset impairment charges and other costs associated with organizational changes and store closings. 2018 included costs and expenses primarily associated with the organizational changes and store closings announced in January 2019, while 2017 included costs and expenses primarily associated with the organizational changes and store closings announced in August 2017 and January 2018. 2018 and 2017 included $39 million and $57 million, respectively, of non-cash net benefit plan income relating to the Company's defined benefit plans. This income includes the net of: interest cost, expected return on plan assets and amortization of prior service costs or credits and actuarial gains and losses. plans and are the result of an increase in lump sum distributions associated with retiree distribution elections and restructuring activity. Net interest expense, excluding losses and gains on early retirement of debt, for 2018 decreased $74 million from 2017. This decrease was primarily driven by the reduction in the Company's debt resulting from the tender offer repurchases in 2017 and open market repurchases in 2018. In 2018, the Company repurchased approximately $344 million face value of senior notes and debentures and completed a tender offer debt repurchase of $750 million face value of senior notes and debentures. As a result of these transactions, the Company recognized $33 million in expenses and fees net of the write-off of unamortized debt premiums. In 2017, the Company repurchased approximately $247 million face value of senior notes and debentures and completed a tender offer debt repurchase of $400 million face value of senior notes and debentures. As a result of these transactions, the Company recognized a $10 million benefit related to the write-off of the unamortized premium associated with the debt repayments, net of the premium costs and other expenses. The Company's effective tax rate was expense of 22.7% for 2018 and a benefit of 2.6% for 2017. On a comparative basis, the 2018 rate reflects the Company's lower federal income tax statutory rate of 21% as compared to 35% resulting from the U.S. federal tax reform enacted in 2017. 2017 included the recognition of a non-cash tax benefit of $584 million associated with the remeasurement of the Company's deferred tax balances due to U.S. federal tax reform. Further, 2017 included the recognition of approximately $15 million of net tax shortfalls associated with share-based payment awards. Net income attributable to Macy's, Inc. shareholders for 2018 decreased $458 million compared to 2017, driven by higher taxes and lower earnings before interest and taxes ("EBIT"), partially offset by higher credit card revenue and lower net interest expense. Net sales for 2017, which included a 53rd week, decreased $969 million or 3.7% compared to 2016. The decrease in comparable sales on an owned basis for 2017 was 2.2% compared to 2016. The decrease in comparable sales on an owned plus licensed basis for 2017 was 1.9% compared to 2016. Geographically, sales in 2017 were strongest in Florida, Eastern Texas, Louisiana, Hawaii, Oregon, Southern California and Arizona. Digital sales continued to be strong in 2017 and experienced double digit growth. By family of business, sales in 2017 were strongest in active apparel, fine jewelry, fragrances, dresses and men's tailored clothing. Sales in 2017 were less strong in handbags although the trend improved in the second half of the year. Sales of the Company's private label brands represented approximately 20% of net sales in the Macy's-branded operations in 2017 and 2016.
Credit card revenues, net were $702 million for 2017, an increase of $46 million compared to $656 million recognized in 2016. Increased proprietary card usage driven by the enhanced Macy's Star Rewards loyalty program drove the favorable results. Cost of sales for 2017 decreased $485 million from 2016. The cost of sales rate as a percent to net sales of 60.9% was 40 basis points higher in 2017, as compared to 60.5% in 2016, primarily due to higher delivery expenses associated with the Company's omnichannel activities and free shipping promotions. SG&A expenses for 2017 decreased $303 million from 2016, however, the SG&A rate as a percent to net sales of 35.9% was 20 basis points higher in 2017, as compared to 2016. The dollar decrease from 2016 was mainly due to store closings and the restructuring activities announced in 2016 and 2017, offset slightly by higher expenses associated with the continued investments in the Company's omnichannel operations, and investments in bluemercury and Macy's Backstage. Advertising expense, net of cooperative advertising allowances, was $1,108 million for 2017 compared to $1,153 million for 2016. The Company recognized gains of $544 million in 2017 associated with sales of real estate, as compared to $209 million in 2016. 2017 included gains of $234 million related to the Macy's Union Square location, $71 million related to the Macy's Brooklyn transaction, $47 million related to the downtown Minneapolis properties and $40 million related to the downtown Seattle Macy's location. 2016 included $33 million of gains related to the Macy's Brooklyn transaction. Restructuring, impairment, store closing and other costs for 2017 and 2016 of $186 million and $479 million, respectively, included severance and other human resource-related costs, asset impairment charges and other costs associated with organizational changes and store closings. 2017 included costs and expenses primarily associated with the organizational changes and store closings announced in August 2017 and January 2018, while 2016 included costs and expenses primarily associated with the organizational changes and store closings announced in August 2016 and January 2017. 2017 and 2016 included $57 million and $55 million, respectively, of non-cash net benefit plan income relating to the Company's defined benefit plans. This income includes the net of: interest cost, expected return on plan assets and amortization of prior service costs or credits and actuarial gains and losses. $105 million and $98 million of non-cash settlement charges were recognized in 2017 and 2016, respectively. These charges relate to the pro-rata recognition of net actuarial losses associated with the Company’s defined benefit retirement plans and are the result of an increase in lump sum distributions associated with retiree distribution elections and restructuring activity. Net interest expense, excluding gains on early retirement of debt, for 2017 decreased $53 million from 2016. This decrease was primarily driven by the early repayment of $647 million of debt and the repayment at maturity of $300 million of debt in 2017. The Company's effective tax rate was a benefit of 2.6% for 2017 and expense of 35.9% for 2016. As previously discussed, 2017 differs from the federal income tax statutory rate of 33.7%, principally due to U.S. federal tax reform enacted in 2017 that led to the recognition of a non-cash tax benefit of $584 million associated with the remeasurement of the Company's deferred tax balances. Further, 2017 included the recognition of approximately $15 million of net tax shortfalls associated with share-based payment awards. Net income attributable to Macy's, Inc. shareholders for 2017 increased compared to 2016, driven by higher operating income due to higher asset sale gains, lower SG&A expenses, restructuring, impairment, store closing and other costs, partially offset by lower sales and gross margin. Coupled with higher credit card revenue, lower net interest expense and a net income tax benefit resulted in net income attributable to Macy's Inc. shareholders increasing by $939 million in 2017 as compared to 2016. The Company's operations are impacted by competitive pressures from department stores, specialty stores, general merchandise stores, manufacturers' outlets, off-price and discount stores, online retailers, catalogs and television shopping, among others. The Company's operations are also impacted by general consumer spending levels, including the impact of general economic conditions, consumer disposable income levels, consumer confidence levels, the availability, cost and level of consumer debt, the costs of basic necessities and other goods and the effects of weather or natural disasters and other factors over which the Company has little or no control. In recent years, consumer spending levels have been affected to varying degrees by a number of factors, including modest economic growth, uncertainty regarding governmental spending and tax policies, unemployment levels, tightened consumer credit, and a fluctuating housing and stock market. In addition, consumer spending levels of international customers are impacted by the strength of the U.S. dollar relative to foreign currencies. These factors have affected, to varying degrees, the amount of funds that consumers are willing and able to spend for discretionary purchases, including purchases of some of the merchandise offered by the Company. All economic conditions ultimately affect the Company's overall operations. However, the effects of economic conditions can be experienced differently and at different times, in the various geographic regions in which the Company operates, in relation to the different types of merchandise that the Company offers for sale, or in relation to each of the Company's branded operations. Net sales are estimated to be approximately flat to 2018. Comparable sales on both an owned and owned plus licensed basis are estimated to be flat to up 1.0%. Credit revenue is estimated to be approximately $740 million to $765 million. Gross margin rate is estimated to be down moderately in the first half and down slightly in the second half of the year. SG&A expense rate is expected to be up slightly with expense savings increasing throughout the year and helping to offset incremental investment spend. Benefit plan income is estimated to be approximately $25 million. Estimated asset sale gains of approximately $100 million. Estimated interest expense of approximately $190 million. Effective tax rate is expected to be 23.0%. Adjusted diluted earnings per share is expected to be $3.05 to $3.25. Adjusted diluted earnings per share, excluding asset sale gains, is expected to be $2.80 to $3.00. Estimated depreciation and amortization of approximately $975 million. Capital expenditures are estimated at approximately $1 billion. The Company's principal sources of liquidity are cash from operations, cash on hand and the credit facility described below. Net cash provided by operating activities was $1,735 million in 2018 compared to $1,976 million in 2017. The decline was driven by lower earnings before interest, taxes, depreciation and amortization ("EBITDA") and higher net inventory investment. These declines in operating cash flows were partially offset by lower cash paid for taxes in 2018 compared to 2017. Net cash used by investing activities for 2018 was $456 million, compared to net cash used by investing activities of $351 million for 2017. Investing activities for 2018 included purchases of property and equipment totaling $657 million and capitalized software of $275 million, compared to purchases of property and equipment totaling $487 million and capitalized software of $273 million for 2017. Capital expenditures were higher by $172 million in 2018 as compared to 2017. This increase in capital expenditures was largely driven by the Company's Growth50 and Backstage strategic initiatives. In 2018, the Company continued to execute on its real estate strategy that includes creating value through monetization and, in some cases, redevelopment of real estate assets. Overall, property and equipment sales, primarily related to real estate, generated cash proceeds of $474 million in 2018 compared to $411 million in 2017. Net cash used by the Company for financing activities was $1,544 million for 2018, including the repayment of $1,149 million of debt and the payment of $463 million of cash dividends, partially offset by the issuance of $45 million of common stock, primarily related to the exercise of stock options, and proceeds of $7 million received from Macy's China Limited's noncontrolling interest shareholder. During December 2018, the Company completed a tender offer and purchased $750 million in aggregate principal amount of certain senior unsecured notes and debentures. The purchased senior unsecured notes and debentures included $164 million of 6.65% senior debentures due 2024, $155 million of 7.0% senior debentures due 2028, $114 million of 6.9% senior debentures due 2029, $103 million of 4.5% senior notes due 2034, $94 million of 6.79% senior debentures due 2027, $35 million of 6.7% senior debentures due 2034, $34 million of 6.375% senior notes due 2037, $34 million of 6.7% senior debentures due 2028, $10 million of 6.9% senior debentures due 2032, $5 million of 8.75% senior debentures due 2029, and $2 million of 7.875% senior debentures due 2030. The total cash cost for the tender offer was $789 million. The Company recognized $28 million of expense related to the recognition of the tender premium and other costs partially offset by the unamortized debt premium associated with this debt. This expense is presented as losses on early retirement of debt on the Consolidated Statements of Income during 2018. During 2018, the Company repurchased $344 million face value of senior notes and debentures. The debt repurchases were made in the open market for a total cost of $354 million, including expenses and other fees related to the transactions. Such repurchases resulted in the recognition of expense of $5 million during 2018 presented as losses on early retirement of debt on the Consolidated Statements of Income. Net cash used by the Company for financing activities was $1,446 million for 2017, including the repayment of $988 million of debt and the payment of $461 million of cash dividends, partially offset by the issuance of $6 million of common stock, primarily related to the exercise of stock options, and proceeds of $13 million received from Macy's China Limited's noncontrolling interest shareholder. associated with this debt. This income is presented as gains on early retirement of debt on the Consolidated Statements of Income during 2017. In July 2017, the Company paid $300 million of debt at maturity. During the first and second quarters of 2017, the Company repurchased $247 million face value of senior notes and debentures. The debt repurchases were made in the open market for a total cash cost of $257 million, including expenses related to the transactions. Such repurchases resulted in the recognition of expense of $1 million during 2017 presented as losses on early retirement of debt on the Consolidated Statements of Income. The Company entered into a credit agreement with certain financial institutions as of May 6, 2016 providing for revolving credit borrowings and letters of credit in an aggregate amount not to exceed $1,500 million (which may be increased to $1,750 million at the option of the Company, subject to the willingness of existing or new lenders to provide commitments for such additional financing) outstanding at any particular time. This agreement is set to expire May 6, 2021 and replaced the prior agreement which was set to expire May 10, 2018. As of February 2, 2019 and February 3, 2018, there were no revolving credit loans outstanding under this credit agreement, and there were no borrowings under the agreement during 2018 and 2017. In addition, there were no standby letters of credit outstanding at February 2, 2019 and February 3, 2018. Revolving loans under the credit agreement bear interest based on various published rates. The Company is party to a $1,500 million unsecured commercial paper program. The Company may issue and sell commercial paper in an aggregate amount outstanding at any particular time not to exceed its then-current combined borrowing availability under the bank credit agreement with certain financial institutions. There were no borrowings under the program during 2018 and 2017. As of February 2, 2019 and February 3, 2018, there were no remaining borrowings outstanding under the commercial paper program. The credit agreement requires the Company to maintain a specified interest coverage ratio for the latest four quarters of no less than 3.25 and a specified leverage ratio as of and for the latest four quarters of no more than 3.75. The Company's interest coverage ratio for 2018 was 11.22 and its leverage ratio at February 2, 2019 was 1.74, in each case as calculated in accordance with the credit agreement. The interest coverage ratio is defined as EBITDA divided by net interest expense and the leverage ratio is defined as debt divided by EBITDA. For purposes of these calculations EBITDA is calculated as net income plus interest expense, taxes, depreciation, amortization, non-cash impairment of goodwill, intangibles and real estate, non-recurring cash charges not to exceed in the aggregate $300 million and extraordinary losses less interest income and non-recurring or extraordinary gains. Debt is adjusted to exclude the premium on acquired debt and net interest is adjusted to exclude the amortization of premium on acquired debt and premium on early retirement of debt. A breach of a restrictive covenant in the Company's credit agreement or the inability of the Company to maintain the financial ratios described above could result in an event of default under the credit agreement. In addition, an event of default would occur under the credit agreement if any indebtedness of the Company in excess of an aggregate principal amount of $150 million becomes due prior to its stated maturity or the holders of such indebtedness become able to cause it to become due prior to its stated maturity. Upon the occurrence of an event of default, the lenders could, subject to the terms and conditions of the credit agreement, elect to declare the outstanding principal, together with accrued interest, to be immediately due and payable. Moreover, most of the Company's senior notes and debentures contain cross-default provisions based on the non-payment at maturity, or other default after an applicable grace period, of any other debt, the unpaid principal amount of which is not less than $100 million that could be triggered by an event of default under the credit agreement. In such an event, the Company's senior notes and debentures that contain cross-default provisions would also be subject to acceleration. At February 2, 2019, no notes or debentures contain provisions requiring acceleration of payment upon a debt rating downgrade. However, the terms of approximately $3,759 million in aggregate principal amount of the Company's senior notes outstanding at that date require the Company to offer to purchase such notes at a price equal to 101% of their principal amount plus accrued and unpaid interest in specified circumstances involving both a change of control (as defined in the applicable indenture) of the Company and the rating of the notes by specified rating agencies at a level below investment grade. As of February 2, 2019, the Company had $1,716 million of authorization remaining under its share repurchase program. The Company may continue or, from time to time, suspend repurchases of shares under its share repurchase program, depending on prevailing market conditions, alternate uses of capital and other factors. On February 22, 2019, the Company's board of directors declared a quarterly dividend of 37.75 cents per share on its common stock, payable April 1, 2019, to shareholders of record at the close of business on March 15, 2019. (a) Operating leases include executed leases not yet commenced. “Other obligations” in the foregoing table includes post employment and postretirement benefits, self-insurance reserves, group medical/dental/life insurance programs, merchandise purchase obligations and obligations under outsourcing arrangements, construction contracts, energy and other supply agreements identified by the Company and liabilities for unrecognized tax benefits that the Company expects to settle in cash in the next year excluding interest and penalties. The Company's merchandise purchase obligations fluctuate on a seasonal basis, typically being higher in the summer and early fall and being lower in the late winter and early spring. The Company purchases a substantial portion of its merchandise inventories and other goods and services otherwise than through binding contracts. Consequently, the amounts shown as “Other obligations” in the foregoing table do not reflect the total amounts that the Company would need to spend on goods and services in order to operate its businesses in the ordinary course. Of the Company's $149 million of unrecognized tax benefits at February 2, 2019, within "other obligations" in the foregoing table, the Company has excluded $4 million of deferred tax assets and $117 million of long-term liabilities for unrecognized tax benefits for various tax positions taken. The table also excludes federal, state and local interest and penalties related to unrecognized tax benefits of $56 million. These liabilities may increase or decrease over time as a result of tax examinations, and given the status of examinations, the Company cannot reliably estimate the period of any cash settlement with the respective taxing authorities. purposes including the redemption or repurchase of debt, equity or other securities through open market purchases, privately negotiated transactions or otherwise, and the funding of pension related obligations. The Company intends from time to time to consider additional acquisitions of, and investments in, retail businesses and other complementary assets and companies. Acquisition transactions, if any, are expected to be financed from one or more of the following sources: cash on hand, cash from operations, borrowings under existing or new credit facilities and the issuance of long-term debt or other securities, including common stock. The Company reports its financial results in accordance with GAAP. However, management believes that certain non-GAAP financial measures provide users of the Company's financial information with additional useful information in evaluating operating performance. Management believes that providing supplemental changes in comparable sales on an owned plus licensed basis, which includes the impact of growth in comparable sales of departments licensed to third parties, assists in evaluating the Company's ability to generate sales growth, whether through owned businesses or departments licensed to third parties, on a comparable basis, and in evaluating the impact of changes in the manner in which certain departments are operated. In addition, management believes that excluding certain items that are not associated with the Company's core operations and that may vary substantially in frequency and magnitude period-to-period from diluted earnings per share attributable to Macy's, Inc. shareholders, EBIT and EBITDA, including as a percent to sales, provide useful supplemental measures that assist in evaluating the Company's ability to generate earnings and leverage sales, respectively, and to more readily compare these metrics between past and future periods. Management also believes that EBIT, EBITDA, Adjusted EBIT and Adjusted EBITDA are frequently used by investors and securities analysts in their evaluations of companies, and that such supplemental measures facilitate comparisons between companies that have different capital and financing structures and/or tax rates. In addition, management believes that ROIC is a useful supplemental measure in evaluating how efficiently the Company employs its capital. The Company uses some of these non-GAAP financial measures as performance measures for components of executive compensation. The reconciliation of the forward-looking non-GAAP financial measure of changes in comparable sales on an owned plus licensed basis to GAAP comparable sales (i.e., on an owned basis) is in the same manner as illustrated below, where the impact of growth in comparable sales of departments licensed to third parties is the only reconciling item. In addition, the Company does not provide the most directly comparable forward-looking GAAP measure of diluted earnings per share attributable to Macy’s, Inc. shareholders excluding certain items because the timing and amount of excluded items are unreasonably difficult to fully and accurately estimate. The following is a tabular reconciliation of the non-GAAP financial measure of changes in comparable sales on an owned plus licensed basis, to GAAP comparable sales (i.e., on an owned basis), which the Company believes to be the most directly comparable GAAP financial measure. Represents the period-to-period percentage change in net sales from stores in operation throughout the year presented and the immediately preceding year and all online sales, adjusting for the 53rd week in 2017, excluding commissions from departments licensed to third parties. Stores impacted by a natural disaster or undergoing significant expansion or shrinkage remain in the comparable sales calculation unless the store, or a material portion of the store, is closed for a significant period of time. Definitions and calculations of comparable sales differ among companies in the retail industry. Represents the impact of including the sales of departments licensed to third parties occurring in stores in operation throughout the year presented and the immediately preceding year and all online sales, adjusting for the 53rd week in 2017, in the calculation of comparable sales. The Company licenses third parties to operate certain departments in its stores and online and receives commissions from these third parties based on a percentage of their net sales. In its financial statements prepared in conformity with GAAP, the Company includes these commissions (rather than sales of the departments licensed to third parties) in its net sales. The Company does not, however, include any amounts in respect of licensed department sales (or any commissions earned on such sales) in its comparable sales in accordance with GAAP (i.e., on an owned basis). The amounts of commissions earned on sales of departments licensed to third parties are not material to its net sales for the periods presented. The following is a tabular reconciliation of the non-GAAP financial measure diluted earnings per share attributable to Macy's, Inc. shareholders, excluding certain items, to GAAP diluted earnings per share attributable to Macy's, Inc. shareholders, which the Company believes to be the most directly comparable GAAP measure. (a) 2018 excludes impairment, restructuring, and other costs attributable to the noncontrollling interest shareholder of $8 million. The following is a tabular reconciliation of the non-GAAP financial measure EBIT and EBITDA, as adjusted to exclude certain items ("Adjusted EBIT and Adjusted EBITDA"), as a percent to net sales to GAAP net income attributable to Macy's, Inc. shareholders as a percent to net sales, which the Company believes to be the most directly comparable GAAP financial measure. The Company defines ROIC as adjusted EBITDA, excluding net rent expense, as a percent to average invested capital. Average invested capital is comprised of an annual two-point (i.e., end of the year presented and the immediately preceding year) average of gross property and equipment, a capitalized value of non-capitalized leases equal to periodic annual reported net rent expense multiplied by a factor of eight and a four-point (i.e., end of each quarter within the period presented) average of other selected assets and liabilities. The calculation of the capitalized value of non-capitalized leases is consistent with industry and credit rating agency practice and the specified assets are subject to a four-point average to compensate for seasonal fluctuations. The following is a tabular reconciliation of the non-GAAP financial measure of ROIC to net income as a percent to property and equipment - net, which the Company believes to be the most directly comparable GAAP financial measure. Merchandise inventories are valued at the lower of cost or market using the last-in, first-out (LIFO) retail inventory method. Under the retail inventory method, inventory is segregated into departments of merchandise having similar characteristics, and is stated at its current retail selling value. The retail inventory method inherently requires management judgments and estimates, such as the amount and timing of permanent markdowns to clear unproductive or slow-moving inventory, which may impact the ending inventory valuation as well as gross margins. Permanent markdowns designated for clearance activity are recorded when the utility of the inventory has diminished. Factors considered in the determination of permanent markdowns include current and anticipated demand, customer preferences, age of the merchandise and fashion trends. When a decision is made to permanently mark down merchandise, the resulting gross margin reduction is recognized in the period the markdown is recorded. The carrying values of long-lived assets are periodically reviewed by the Company whenever events or changes in circumstances indicate that the carrying value may not be recoverable, such as historical operating losses or plans to close stores before the end of their previously estimated useful lives. Additionally, on an annual basis, the recoverability of the carrying values of individual stores is evaluated. A potential impairment has occurred if projected future undiscounted cash flows are less than the carrying value of the assets. The estimate of cash flows includes management's assumptions of cash inflows and outflows directly resulting from the use of those assets in operations. When a potential impairment has occurred, an impairment write-down is recorded if the carrying value of the long-lived asset exceeds its fair value. The Company believes its estimated cash flows are sufficient to support the carrying value of its long-lived assets. If estimated cash flows significantly differ in the future, the Company may be required to record asset impairment write-downs. If the Company commits to a plan to dispose of a long-lived asset before the end of its previously estimated useful life, estimated cash flows are revised accordingly, and the Company may be required to record an asset impairment write-down. Additionally, related liabilities arise such as severance, contractual obligations and other accruals associated with store closings from decisions to dispose of assets. The Company estimates these liabilities based on the facts and circumstances in existence for each restructuring decision. The amounts the Company will ultimately realize or disburse could differ from the amounts assumed in arriving at the asset impairment and restructuring charge recorded. Income taxes are estimated based on the tax statutes, regulations and case law of the various jurisdictions in which the Company operates. Deferred income tax assets and liabilities are recognized for the future tax consequences attributable to differences between the financial statement carrying amounts of existing assets and liabilities and their respective tax bases, and net operating loss and tax credit carryforwards. Deferred income tax assets and liabilities are measured using enacted tax rates expected to apply to taxable income in the years in which those temporary differences are expected to be recovered or settled. Deferred income tax assets are evaluated for recoverability based on all available evidence, including past operating results, estimates of future taxable income, and the feasibility of tax planning strategies. Deferred income tax assets are reduced by a valuation allowance when it is more likely than not that some portion of the deferred income tax assets will not be realized. Uncertain tax positions are recognized if the weight of available evidence indicates that it is more likely than not that the tax position will be sustained on examination, including resolution of any related appeals or litigation processes, based on the technical merits of the position. Uncertain tax positions meeting the more-likely-than-not recognition threshold are then measured to determine the amount of benefit eligible for recognition in the financial statements. Each uncertain tax position is measured at the largest amount of benefit that is more likely than not to be realized upon ultimate settlement. Uncertain tax positions are evaluated and adjusted as appropriate, while taking into account the progress of audits of various taxing jurisdictions. Resolution of these matters could have a material impact on the Company's consolidated financial position, results of operations or cash flows. Significant judgment is required in evaluating the Company's uncertain tax positions, provision for income taxes, and any valuation allowance recorded against deferred tax assets. Although the Company believes that its judgments are reasonable, no assurance can be given that the final tax outcome of these matters will not be different from that which is reflected in the Company's historical income provisions and accruals. The Company has a funded defined benefit pension plan (the “Pension Plan”) and an unfunded defined benefit supplementary retirement plan (the “SERP”). The Company accounts for these plans in accordance with ASC Topic 715, Compensation - Retirement Benefits. Under ASC Topic 715, an employer recognizes the funded status of a defined benefit postretirement plan as an asset or liability on the balance sheet and recognizes changes in that funded status in the year in which the changes occur through comprehensive income. Additionally, pension expense is generally recognized on an accrual basis over the average remaining lifetime of participants. The pension expense calculation is generally independent of funding decisions or requirements. The Pension Protection Act of 2006 provides the funding requirements for the Pension Plan which are different from the employer's accounting for the plan as outlined in ASC Topic 715. No funding contributions were required, and the Company made no funding contributions to the Pension Plan in 2018 and 2017. As of the date of this report, the Company does not anticipate making funding contributions to the Pension Plan in 2019. Management believes that, with respect to the Company's current operations, cash on hand and funds from operations, together with available borrowing under its credit facility and other capital resources, will be sufficient to cover the Company's Pension Plan cash requirements in both the near term and also over the longer term. The calculation of pension expense and pension liabilities requires the use of a number of assumptions. Changes in these assumptions can result in different expense and liability amounts, and future actual experience may differ significantly from current expectations. The Company believes that the most critical assumptions relate to the long-term rate of return on plan assets (in the case of the Pension Plan) and the discount rate used to determine the present value of projected benefit obligations. The Company's assumed annual long-term rate of return for the Pension Plan's assets was 6.75% for 2018, and 7.00% for 2017 and 2016 based on expected future returns on the portfolio of assets. For 2019, the Company is lowering the assumed annual long-term rate of return to 6.50% based on expected future returns of the portfolio of assets. The Company develops its expected long-term rate of return assumption by evaluating input from several professional advisors taking into account the asset allocation of the portfolio and long-term asset class return expectations, as well as long-term inflation assumptions. Pension expense increases or decreases as the expected rate of return on the assets of the Pension Plan decreases or increases, respectively. Lowering or raising the expected long-term rate of return assumption on the Pension Plan's assets by 0.25% would increase or decrease the estimated 2019 pension expense by approximately $7 million. The Company discounted its future pension obligations using a weighted-average rate of 4.03% at February 2, 2019 and 3.74% at February 3, 2018 for the Pension Plan and 4.10% at February 2, 2019 and 3.78% at February 3, 2018 for the SERP. The discount rate used to determine the present value of the Company's Pension Plan and SERP obligations is based on a yield curve constructed from a portfolio of high quality corporate debt securities with various maturities. Each year's expected future benefit payments are discounted to their present value at the appropriate yield curve rate, thereby generating the overall discount rate for Pension Plan and SERP obligations. As the discount rate is reduced or increased, the pension liability would increase or decrease, respectively, and future pension expense would decrease or increase, respectively. Lowering the discount rates by 0.25% would increase the projected benefit obligations at February 2, 2019 by approximately $77 million and would decrease estimated 2019 pension expense by approximately $3 million. Increasing the discount rates by 0.25% would decrease the projected benefit obligations at February 2, 2019 by approximately $72 million and would increase estimated 2019 pension expense by approximately $3 million. The Company estimates the service and interest cost components of net periodic benefit costs for the Pension Plan and SERP. This method uses a full yield curve approach in the estimation of these components of net periodic benefit costs. Under this approach, the Company applies discounting using individual spot rates from the yield curve composed of the rates of return from a portfolio of high quality corporate debt securities available at the measurement date. These spot rates align to each of the projected benefit obligation and service cost cash flows. See Note 1, "Organization and Summary of Significant Accounting Policies," of the Consolidated Financial Statements for discussion on new accounting pronouncements. The Company is exposed to market risk from changes in interest rates that may adversely affect its financial position, results of operations and cash flows. In seeking to minimize the risks from interest rate fluctuations, the Company manages exposures through its regular operating and financing activities and, when deemed appropriate, through the use of derivative financial instruments. The Company does not use financial instruments for trading or other speculative purposes and is not a party to any leveraged financial instruments. The Company is exposed to interest rate risk through its borrowing activities, which are described in Note 6 to the Consolidated Financial Statements. All of the Company’s borrowings are under fixed rate instruments. However, the Company, from time to time, may use interest rate swap and interest rate cap agreements to help manage its exposure to interest rate movements and reduce borrowing costs. At February 2, 2019, the Company was not a party to any derivative financial instruments and based on the Company’s lack of market risk sensitive instruments outstanding at February 2, 2019, the Company has determined that there was no material market risk exposure to the Company’s consolidated financial position, results of operations or cash flows as of such date. Consolidated Financial Statements and Supplementary Data. The Company’s Chief Executive Officer and Chief Financial Officer have carried out, as of February 2, 2019, with the participation of the Company’s management, an evaluation of the effectiveness of the Company’s disclosure controls and procedures, as defined in Rule 13a-15(e) under the Exchange Act. Based upon this evaluation, the Chief Executive Officer and Chief Financial Officer have concluded that as of February 2, 2019 the Company’s disclosure controls and procedures are effective to provide reasonable assurance that information required to be disclosed by the Company in reports the Company files under the Exchange Act is recorded, processed, summarized and reported, within the time periods specified in the SEC rules and forms, and that information required to be disclosed by the Company in the reports the Company files or submits under the Exchange Act is accumulated and communicated to the Company’s management, including its Chief Executive Officer and Chief Financial Officer, as appropriate to allow timely decisions regarding required disclosure. The Company’s management is responsible for establishing and maintaining adequate internal control over financial reporting, as defined in Exchange Act Rule 13a-15(f). The Company’s management conducted an assessment of the Company’s internal control over financial reporting based on the framework established by the Committee of Sponsoring Organizations of the Treadway Commission in Internal Control – Integrated Framework (2013). Based on this assessment, the Company’s management has concluded that, as of February 2, 2019, the Company’s internal control over financial reporting is effective. The Company’s independent registered public accounting firm, KPMG LLP, has audited the effectiveness of the Company’s internal control over financial reporting as of February 2, 2019 and has issued an attestation report expressing an unqualified opinion on the effectiveness of the Company’s internal control over financial reporting, as stated in their report located on page F-3. From time to time major organizational restructuring and realignment occurs for which the Company reviews its internal control over financial reporting. As a result of this review, there were no changes in the Company’s internal control over financial reporting that occurred during the Company’s most recently completed quarter that materially affected, or are reasonably likely to materially affect, the Company’s internal control over financial reporting. The information required by this item for executive officers is set forth under “Item 1. Business - Executive Officers of the Registrant” in this report. The other information called for by this item is set forth under “Item 1. Election of Directors” and “Further Information Concerning the Board of Directors - Committees of the Board” and “Section 16(a) Beneficial Ownership Reporting Compliance” in the Proxy Statement to be delivered to stockholders in connection with the 2019 Annual Meeting of Shareholders (the “Proxy Statement”), and incorporated herein by reference. https://www.macysinc.com. We intend to satisfy any disclosure requirement under Item 5 of Form 8-K regarding an amendment to, or waiver from, a provision of the Code of Conduct by posting such information to the Company’s website at the address and location specified above. Set forth below are the names, ages and principal occupations of the Company's non-employee directors as of March 21, 2019. Chairman and Chief Executive Officer of UPS, Inc., a multinational package delivery and supply chain management company, since 2016 and 2014, respectively. Chief Operating Officer of UPS, Inc. since 2007. Former Chairman and Chief Executive Officer of The Home Depot, Inc., a multinational home improvement retailer. Former Chairman and Chief Executive Officer of Kellogg Company, a multinational cereal and snack food producer. Former President, North American Pharmaceuticals of GlaxoSmithKline, a global pharmaceutical company. President and Chief Executive Officer of RLJ Lodging Trust, a publicly-traded lodging real estate investment trust, since 2018. President and Chief Executive Officer of Four Corners Property Trust, Inc., a real estate investment trust, since 2015. Co-Founder and Director of Katapult, a digital entertainment company making products for today's creative generation, since 2013. Former President and Chief Executive Officer of Girls Incorporated, a national non-profit research, education and advocacy organization. Former Chairman and Chief Executive Officer of Brown-Forman Corporation, a spirits and wine company. Former Chief Executive Officer of Allianz Global Investors Capital, a diversified global investment firm. Information called for by this item is set forth under “Compensation Discussion & Analysis,” “Compensation of the Named Executives for 2018,” “Compensation Committee Report,” “Compensation Committee Interlocks and Insider Participation” and "Further Information Concerning the Board of Directors – Risk Oversight" in the Proxy Statement and incorporated herein by reference. Information called for by this item is set forth under “Stock Ownership – Certain Beneficial Owners,” “Stock Ownership – Securities Authorized for Issuance Under Equity Compensation Plans,” and “Stock Ownership – Stock Ownership of Directors and Executive Officers” in the Proxy Statement and incorporated herein by reference. Information called for by this item is set forth under “Further Information Concerning the Board of Directors – Director Independence” and “Policy on Related Person Transactions” in the Proxy Statement and incorporated herein by reference. Information called for by this item is set forth under “Item 2. Ratification of the Appointment of Independent Registered Public Accounting Firm” in the Proxy Statement and incorporated herein by reference. The list of financial statements required by this item is set forth in Item 8 “Consolidated Financial Statements and Supplementary Data” and is incorporated herein by reference. All schedules are omitted because they are inapplicable, not required, or the information is included elsewhere in the Consolidated Financial Statements or the notes thereto. Amended and Restated Credit Card Program Agreement, dated November 10, 2014, among the Company, FDS Bank, Macy's Credit and Customer Services, Inc. (“MCCS”), Macy's West Stores, Inc., Bloomingdales, Inc., Department Stores National Bank ("DSNB") and Citibank, N.A.